-> Creating target 'iqn.2011-12.org.pjack:foo1' for driver 'iscsi': done. -> Opening device 'disk01' using handler 'vdisk_blockio': done. -> Adding device 'disk01' at LUN 0 to driver/target 'iscsi/iqn.2011-12.org.pjack:foo1': done. -> Driver/target is not a fibre channel target, ignoring. -> Enabling driver/target 'iscsi/iqn.2011-12.org.pjack:foo1': done. -> Enabling driver 'iscsi': done. -> Done, 0 change(s) made. -> Disabling driver/target 'iscsi/iqn.2011-12.org.pjack:foo1': done. -> Removing LUN 0 from driver/target 'iscsi/iqn.2011-12.org.pjack:foo1': done. -> Closing device 'disk01' using handler 'vdisk_blockio': done. -> Removing virtual target 'iqn.2011-12.org.pjack:foo1' from driver 'iscsi': done. Writes the current configuration to < file>. List all attributes for a given handler. List all attributes for a given device. List all attributes for a given driver. 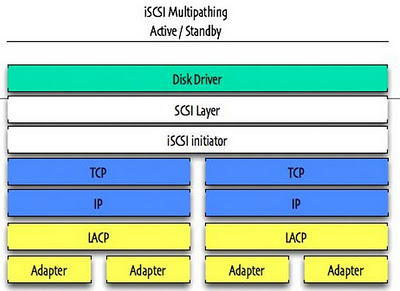 When implementing iSCSI in your server operating system you have two choices, software or hardware (using Host Block Adapter). Hardware: A Host Bus Adapter is a PCI card that performs the TCP processing. This is known as TCP Offload and the cards are generally known as TCP Offload Engines or TOE. iSCSI Header and Data Digest calculations are very CPU intensive. Only a full iSCSI offload HBA has the logic built into the ASIC to accelerate these calculations. This is defined in the iSCSI RFC as the method for achieving high availability. 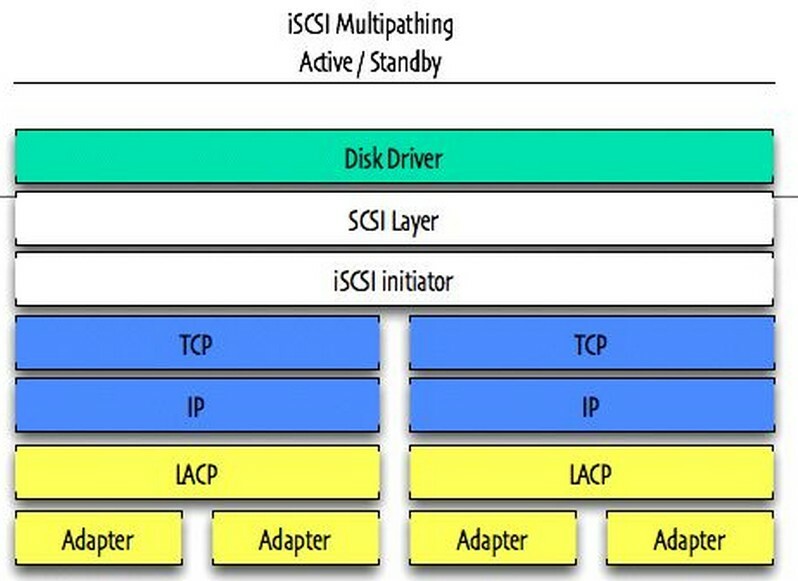 The iSCSI initiator will initiate at least two TCP connections to the iSCSI target. Data will flow down the primary connection until a failure is detected and data will then be diverted to the second connection.